We have been doing a lot of house projects around the house. More than just the girls room, although that’s our main focus. We’ve also painted other rooms in the house and with new paint colors comes new decorations. You quickly find the old stuff doesn’t match anymore. And that was the case for our dining room and kitchen valance. I found the perfect color fabric at Joann’s for 50 percent off their red tag. I think I bought a couple yards of this green home decor fabric for $9. This is when doing it yourself actually pays off, when you can make it for cheaper than you can purchase it. If you make something inspired by Simply Modern Mom, please upload pictures of it to our Flickr group to show it off to everyone. You may be featured on Simply Modern Mom. 1. 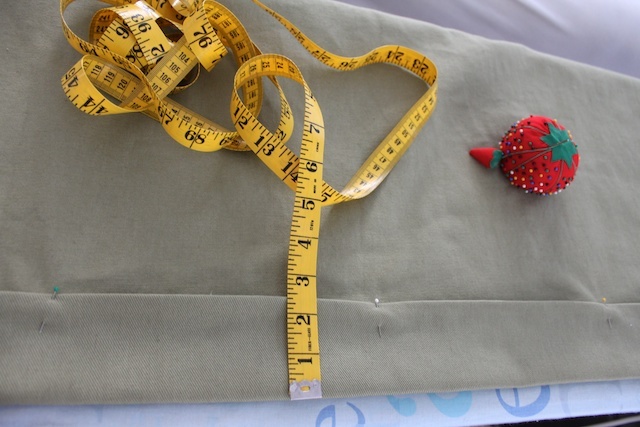 Measure your window’s width to find out how much fabric you will need. And also measure how long you want the valance to hang. Take into account where the curtain rod will be. 2. 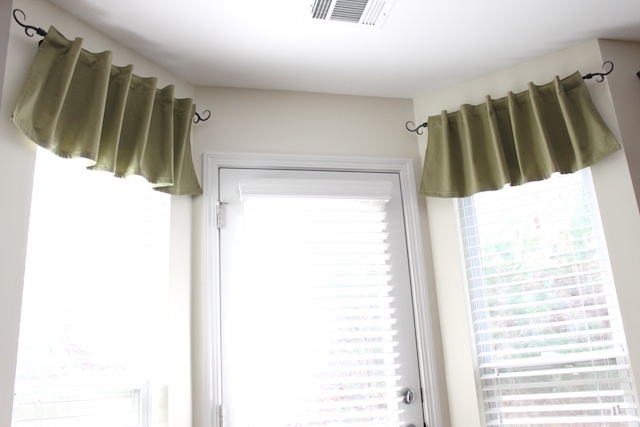 Cut a large rectangular piece for your valance. 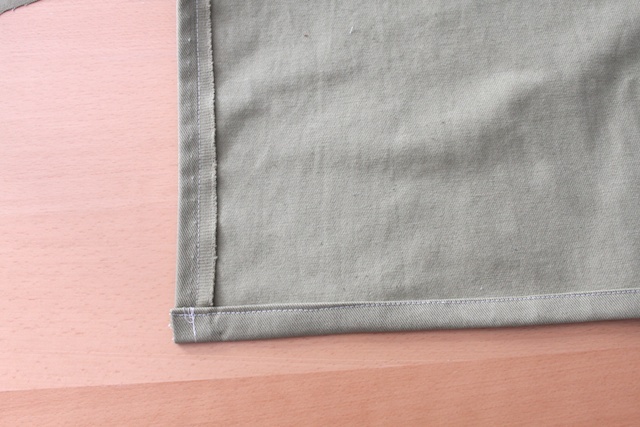 For the width, depending on how gathered you want the valance, take the width of your window and double that number. Then add 2 inches for the seam allowance. If you want a little less gathered, do less. If you want it to really bunch up, then do more. Then for the length, measure how long you want the valance to hang then add 4 inches for the seam allowance. 3. 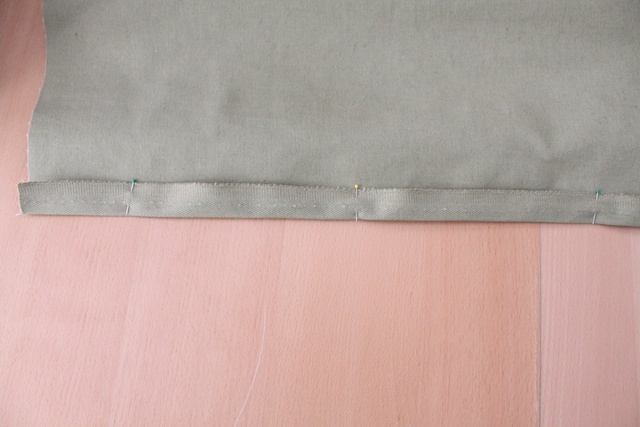 Use the pinking shears to cut tabs for your curtain rods. Cut them 2 x 4 inches. These tabs will not be visible from the front. That’s why we are taking a short cut and using pinking shears rather than sewing all the ends of each tab. 4. 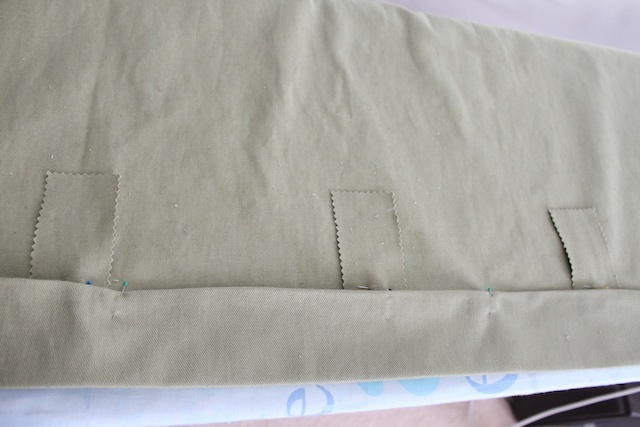 Take the valance, fold the two sides at 1-inch, iron or pin, then sew in place. Since I didn’t cut the sides I kept the selvage and just folded it once and sewed away. 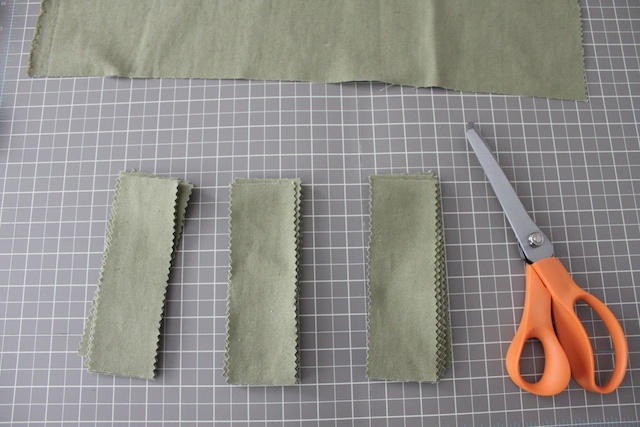 If you did cut the sides, fold over twice at 1/2-inch each fold and sew. 5. 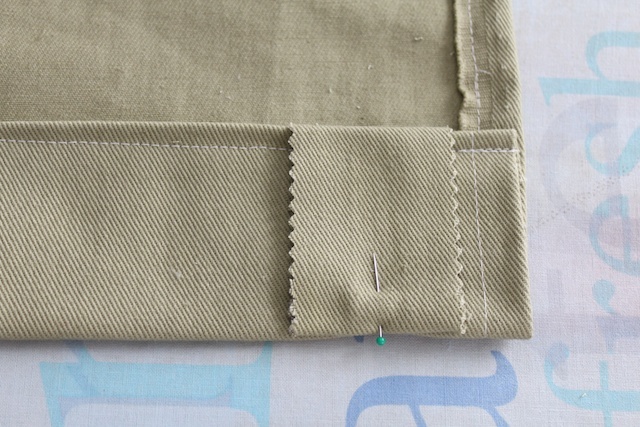 The bottom part of the valance, fold 1/2-inch twice and sew the bottom seam all the way across. 6. 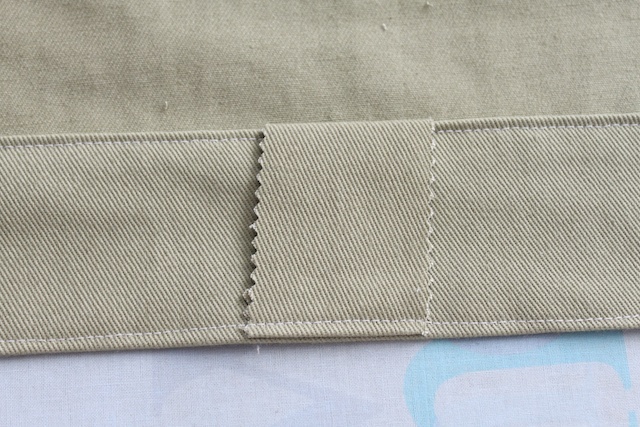 The top seam is where you will be putting the tabs. So first, fold the top down at 1/2-inch. Then fold it down again at 2 1/2-inch with the first fold tucked under. Iron then pin in place. 7. Before you sew the top seam in place. Measure out where you want to put your tabs. 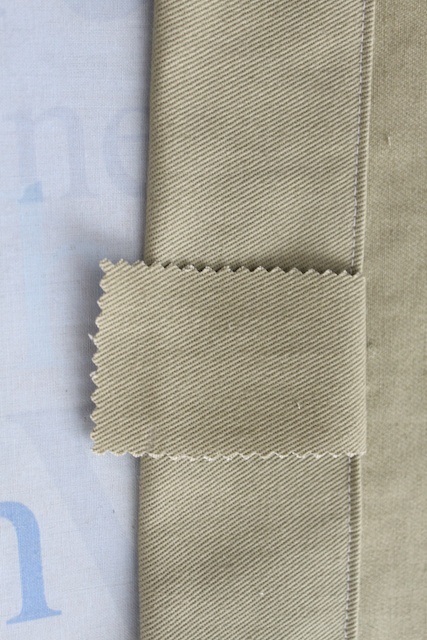 Pin the tabs in place with one end, 1/2-inch, tucked under the open fold of the top seam. Now sew it all in place. Now when you fold the tab over, there should be some excess for the other side. 8. Fold the excess under and pin. Sew it all the way across as it sews all the tabs in place. And done! Great tutorial. I am about to make some for my daughter’s bed room and this is much easier that what I was going to try. Thank you. Just thought you’d like to know that the scissors that make the zig-zag cut, or any other scissors, are “shears,” not “sheers.” Sheers are see-through curtains. I did like your valances! What a ugly thing to say! She has been generous enough to share her pattern and show us how to make the curtains. I think most people knew exactly what she was saying, shear or sheer. I love these. I’ve been looking and looking for a valance for my bedroom window to add more color to the room. I’m actually going to be using the bedskirt that came with my comforter so it’ll definitely match. I think the weight of the fabric will work perfect for this pattern. thank you. . . . 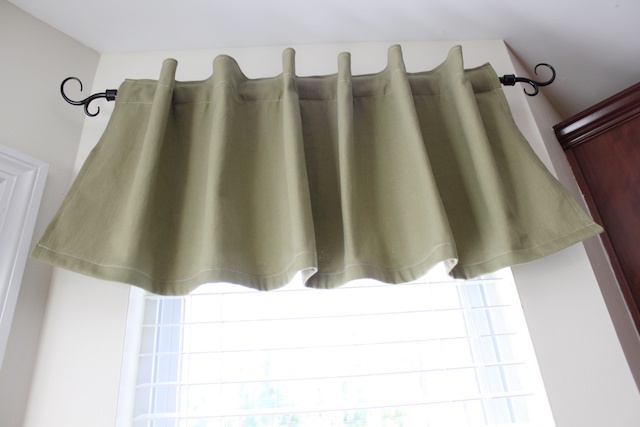 I have been looking for a different way to hang a valance other than rod pocket or tabs. This is a slightly different look combining both methods. I love it. Thanks you! Your tutorial was very detailed and easy to follow. I love my new valance! i am about to start this project and while reading through the instructions, I’m not clear as to how to determine how many tabs I need and how to determine where they are placed.